The city of Leipzig is a fair city with a long tradition. It is the most populous city in Saxony with around 500,000 inhabitants. 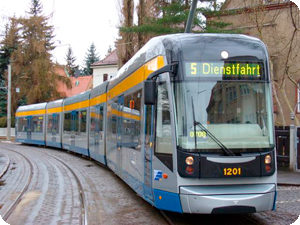 On behalf of city of Leipzig, Leipzig Transport Authority GmbH (LVB) is responsible for the long term with the provision of regular services in public transport until at least 2028. Currently it operates 14 tram lines. In addition, 60 bus routes in the city and in the region are operated by the LVB GmbH. In 2009, a total of 126.5 million passengers were transported.